Times weren’t as simple as they used to be for Amazon tribes. The jungles were once their private territory, where they were free to hunt beasts, redecorate their villages, and do the occasional raid on villages outside the jungle or travelling caravans to steal small men to keep their matriarchal society going. But now the jungles were less unknown by outsiders and adventurers keep popping up more and more every year. They stole the Amazons’ kills and ransacked their villages for loot. The worst was when the less-scrawny men managed to woo away one of their sisters to be his girlfriend/bride. There were even Amazons getting bored with living in the jungle and seeking better fortunes in other lands. The times were grim. The evil Overlord Bob was extending his tyrannical reach farther with every day. Many heroes have gone to stop his evil, but all of them failed, most being transformed into various female forms and becoming a part of his household. There seemed to be nothing that could defeat the dark ruler and save the land, but there were some who were determined to keep trying. The master wizard, Standoff, was one of those who wished to see the downfall of Overlord Bob, but he was wise enough to see a direct confrontation would be futile. One of his colleagues had attempted to defeat Bob, now she was a bunny girl magician who would rather use her magic to give stage performances than any true wizardry. Standoff certainly didn’t want to lose his dignity or his manhood. A stealthier means of defeating Bob was in order. The Gestalt Hydra is probably the most unusual creature in the Dragon, Reptilian, and/or Slime races if it could be determined which of the three it best fits in. While other species of hydra generate new heads as a result of age or their regeneration abilities, the Gestalt Hydra takes a completely different approach. It will seek out a humanoid of any kind, usually an adventurer, and swallow them. The consumed humanoid will be absorbed into the Gestalt Hydra, increasing its mass and adding a new head to it. The main head will gain all the knowledge and abilities of the absorbed humanoid, though its skill in using those abilities depend greatly on what stage of development it is in. The Gestalt Hydra goes through five stages of maturity, advancing to the next stage for each two heads it gains. Its behavior and abilities change for each stage. Physical Description: Alolan Tropius is much larger than the mainland version, being at least 12 feet long. Part of that length comes from the thick tail it has developed. The green and brown parts of its body are more blended together and instead of four giant leaves for wings, it has many water weeds growing from its back. Physical Description: Alolan Phanpy have longer ears and trunks than their mainland counterparts. They also have an orange armor plate on their backs. Variant Description: With less predators to worry about and more access to water, Phanpy has taken to spending almost all of its time by or in the river. However, with so many Phanpy crowding the rivers, they have become more territorial, constantly pushing at each other. Their armored backs and larger trunks are the result of their frequent tussling. Even their ears have developed to be as mobile as their trunks and used to push away competitors. Physical Description: The purple parts of her skin have become light brown while her hair has become black. She also wears a skirt of dried grass. Variant Description: In the warmer Alolan region, Smoochum has lost its Ice typing. They have become considerably more independent, wandering around the islands on its own. It has enough psychic power to protect itself. It weaves its grass skirt from fresher material as it gets stronger. The material it uses to expand her skirt indicates how it will evolve. Physical Description: Alolan Psyduck are slimmer in build than their mainland counterparts. Their arms are built more like actual wings though with three feather fingers. They also have a gem in the middle of their forehead like Golduck's. Variant Description: Because of Bruxish's headache-inducing power, poor vulnerable Psyduck was forced to leave the water. Because it has to look for food on dry land, it had to focus on its psychic abilities over its aquatic ones. Its psychic ability has strengthened to the point that it doesn't need a headache to use its powers. Physical Description: Golduck are very different from their mainland counterparts. It retains the yellow coloration of Psyduck and its arms have developed into almost-perfect wings. It also has a longer neck. The others were equally shocked about Minerva’s revelation, but at least, they were able snap out of it after about 20 seconds. Chip, however, was apparently stuck in denial mode and wouldn’t stop screaming. Fortunately, Draco knew his mute code and had applied it. “Now then, I think the question on everyone’s mind is: Minerva, how could you possibly be Chip’s daughter?” asked Jeremie. “Yeah, you look much more fun and cool than Chip is,” said Morph. “I think the bigger objection is Chip’s genderless nature,” said Aelita. “Uh…I really don’t want to tell you how I was born,” said Minerva, looking uncomfortable. Author’s note: The depiction of Malta and its historical sites are not to be considered accurate. I have never been outside the country, let alone to Malta, so all information about Malta is secondhand research. There are bound to be inconsistencies. When the group of shadowy men had reconvened around the six-sided table, there was a very palpable air of nervousness. Both the assassination drones were offline and apparently neither faction leader was dead. This assuredly meant some rather…final demotions and necessary replacements. An insidious meeting takes place in Hell. To hear their words would serve thee well. Death: The time is soon upon us, the Apocalypse draws near. Now my brethren, tell me what I want to hear. As the end draws close, there is something I must know. War: Hear me now! I am War! All is now accounted for! Hatred in the name of God. None are right. All are wrong. 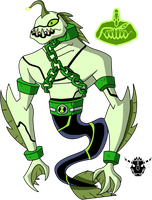 This is about how Azmuth got all the alien DNA stored in the Omnitrix, and it beginns long before Ben found the watch and became a hero. Azmuth and Myaxx just built the lab on Xenon. Azmuth is working on the energy source of the Omnitrix, while Myaxx just came into the lab, obviouly exhausted. Azmuth: Awww shut up, and stop complaining. Your giving me a headache. He jumped from the table, and went to a small door, that only he could fit through. Azmuth: Chech the energy source, and do the calculations again just to be sure. In the meantime...I`m taking a nap. There were some Amazon tribes that were hit badly by the increase of emigration. One example was a village of the Miyaztic tribe that lived not too far from one of the pale-face settlements in cleared jungle land. Too many sisters have left, single or with new hubbies, leaving barely enough to keep the village going. It was time for a change, and the first change was a new goddess to worship. It was becoming clear that their old goddess wasn’t answering their prayers for strength anymore. Either she had died (which seemed unlikely but could happen in a fight with another god), someone had done something unforgiveable to offend her (also unlikely as the tribeswomen weren’t repentant sinners), or she had fallen in love, possibly with a hunky demigod, and forgot all about her patronage to feminine independence (which seemed plausible, gods not being as steadfast in their patronages as they used to be). So, the Amazon elders of the village started interviewing priestesses for a new goddess to worship. There were some obvious rejects, such the Goddess of Night Owls and Coffee, the Goddess of Bats and Angsty Poetry, and one priestess accidentally knocked her headdress off, revealing a headful of tentacles. She was immediately chased out of the villages with spears and slings. The last thing the Miyaztic needed were one of those goddesses. But one priestess sparked their interest in the Calel Comb, Goddess of Bees and Zeal. What they needed was a busy goddess that wouldn’t shirk her work or ignore prayers. Calel Comb was certainly not a slacker, not like the God of Sloths and Sloth. But Calel Comb required a temple, one that would actually test those who would try to loot it. Thankfully, there was a mountain within walking distances of the Miyastic village they could carve a temple out of. And some bartering at the pale-face settlement for the right tools soon saw them beginning the construction. “But one in every six floor tile is a pressure plate,” said Sheza, putting her foot on one. A puff of air came from a hole in the wall. When the temple was finished, it would shoot a bee-patterned dart. “You know dart traps are standard temple traps,” said the forewoman. “They’re…not deadly,” said the forewoman a bit uncertainly. “If they’re not deadly, what’s the point of so many flippin’ dart traps? !” snapped Sheza. “Well, we’re gonna do a test-run. If it flops, we’ll redo the whole thing,” said Sheza before walking off. “One more crack like that and you’re out of here,” threatened the forewoman. “No! Wait! Please! I have three nieces!” pleased the worker. “Eh, I dunno. I just work here,” said the other worker. When the exhaustively-excessive temple was set up, it was time to test it. Fortunately, there was no shortage of adventurers who were willing to test a dungeon for a chance at easy gold. Eventually, three adventurers were chosen, a group of different classes to test how the temple will be able to handle various types. First there was a knight in armor, though not just any armor. The kinda of heavy armor that makes a man seem twice as big as he already is and would crush a weak man like a cave-in. This was the kind of knight who would slowly stride through battle and let his armor do all the defending for him. Then there was a druid, one of the nature-loving mages who could rely on animals, plants, and stones to attack and defend for him. A jungle temple seems like a good place for him to practice his ability. Then there was a ninja, a rare kunoichi from the far east. Compared to normal women, she was rather thin. Compared to the amazons, she was downright spindly. However, her lithe body meant she was much faster, more agile, and can jump higher than most people. Even the amazons were impressed with her agility and speed. Starting down one of the many hallways in the temple, it didn’t take long for the traps to start being triggered. It was practically impossible for them to not be triggered, unless someone could crawl on walls or float over the floor. The darts shot out at the adventurers. Of course, they just pinged off the knight’s armor without touching him at all. The ninja was able to dodge or even catch the darts before they could hit her. It helped that the knight made an effective shield. The druid wasn’t so lucky. There was precious little he could coax into doing his will in this temple and his shields couldn’t protect him from every angle. His robes didn’t block the flight of the darts and they struck through to his flesh. However, the darts didn’t appear to do anything. They didn’t make him drop, swell up, hallucinate, or anything debilitating. They stung, but not unbearably so. As soon as the druid realized how harmless the darts were, he started blocking them less and less. However, the knight and ninja weren’t letting up their guards. A new temple couldn’t possibly be loaded with blank darts. Not to mention it was unwise to let dozens of darts hit you. But another good reason is that druid seemed to get giddier and even sloppier with his shielding as he kept getting stuck. The giggling he was making was rather unnerving as well. Eventually, they got to the central chamber. There were no more dart traps here. Instead, there was a huge pool full of what was undoubtably honey and it looked pretty deep too. There were several hexagonal pillars rising up out of the honey and at the other side of the room on a larger pillar was a shrine. On the shrine was a statue of a golden bee the size of a Fabrige egg. Quite clearly, the only way to get to the shrine and the golden bee was to jump from pillar to pillar. However, as soon as the druid saw the pool, he let out a squeal of glee before running pell-mell towards the room. He took a flying leap, not aiming at any of the pillars. “HONEY!” he squealed joyously before splashing down right in the middle of the pool. Despite the honey’s viscosity, he sunk rather fast. The knight and the ninja looked at the bubbles coming up from where the druid sank. “Well…that happened,” said the knight. “Now we know what all the darts were for,” said the ninja. “So, all we need to do is get to the shrine?” asked the knight. “Not so easy for someone like you,” said the ninja. “Ha, I walk 10 miles a day in this armor,” said the knight, “It doesn’t weigh me down at all.” With that, he jumped for the nearest pillar. It wasn’t too far, but the other pillars were increasingly farther and higher. The knight was soon struggling to keep his balance as he jumped from pillar to pillar. Eventually, he jumped for one pillar and came a little short. He grabbed the pillar, but the surface was too smooth and waxy for him to get a good grip and pull himself up. He struggled, but it was a losing fight. Eventually, with a ‘WHOA!’, he lost his grip and fell into the honey pool. His heavy armor made him sink like a stone. The ninja was studying the chamber with more respect for the temple’s unusual design. Too much exposure to the darts’ poison would give you a euphoric urge to jump into the honey. But relying on heavy armor to get through the darts meant you couldn’t be able to get to the shrine without falling. But someone as light and agile as her can avoid getting too poisoned and be able to cross the pool. The idea was parent to the deed and the ninja was soon leaping from pillar to pillar with ease. The pillars did feel like they were made of solid wax, so they were a bit slick. But the ninja had dealt with worse and before long, she was climbing up the final pillar to the shrine. The ninja looked around. This still felt too easy. Was this temple really designed exclusively for adventurers like her? She understood how amazons respected speed and agility, but this didn’t seem like the best way to keep their sacred relic protected. Well, this was supposed to be a test trial. They might add other traps later to compensate for adventurers like herself. The golden bee was probably not even real gold. She grabbed it, expecting it to be painted wood or something. Instead, she got a massive charge as the statue started glowing and the glowing spread to her body. She should be feeling fear, but she just felt good. Her body was surging with magic as it started reshaping her. She was getting much taller, taller than the average man. But she wasn’t remaining thin. Her body was filling up with curves and muscles like the amazons. Her clothes, which could hardly contain her bigger form, were also becoming the tribal clothes she saw the other amazons wore. Even her skin was becoming darker like the beautiful natives. When the magic was finished, the former ninja was now an amazon like the others. She looked at her bigger, curvier body with amazement. She had felt overshadowed all her life, but now she was head and shoulders over pretty much everyone she knew. Her black ninja garb that had covered most of her body now had yellow stripes and showed off a lot of her darker skin. The former ninja didn’t want to steal the idol any longer. She’s gotten everything she wanted now. She leapt all the way back to the hallway with a single bound. The traps wouldn’t go off on her now. She was a proud member of the Miyaztic tribe. “Ok, this temple is working out a lot better than I would have thought,” said Chief Sheza to High Priestess Bizbi. “Well, she’s definitely helping us get new sisters,” said Sheza. Since the new temple has opened, there has been a pretty steady stream of adventurers who tried their luck. Those who were able to get to the golden bee became new members of the tribe, with the right kind of agility and speed the amazons favored. And those who were men before adjusted very quickly. There were still plenty who failed the temple and ended up in the honey pool. There were those who were like the druid and exposed to too much of the darts’ poisons. When they were fished out, they had become short humanoid bees, fuzzy, cute, and eager to serve the goddess. They were her Scouts, who foraged for food, watched for invaders, and maintained the temple. Those who had tried to use heavy armor to bypass the darts but ended up sinking became a different class. When the knight and others like him were dredged out, they were large humanoid wasps, standing as tall as the amazons and heavily armored in chitin. They were the Defenders, who guarded the village and the temple from anyone who would try to pillage it. They also did the heavy lifting that the amazons couldn’t. “You mean worshipers,” said Sheza. “Right, what did I say?” asked Bizbi. Sheza had a bit of a slight worry that Calel Comb might get a little too powerful and tyrannical over time, but that was the future’s problem. If need be, the amazons could abandon the temple and move to a farther area. But for now, the bee goddess was a good patron. This is my entry for another of 's contests. It's October again and of course that leads up to one thing: HALLOWEEN! In keeping with the theme of the holiday, I'll be doing a series of drawings that will reflect this most macabre of festivities. This year I'll be focusing on the Terrorcons both from Generation 1 and owing more than a little to Transformers: Prime. The basic story behind these stories will be a slight spin-off from G1 continuity. Here, the Decepticons have found a viable new source of energy called Dark Energon, a substance said not to only be more energizing that regular Energon, but gives those who consume it more power. Of course, while Megatron is usually the first to energize himself from the Decepticons' findings, he's not foolish enough to try something that is untested. So he allows the always-ravenous Terrorcons to be the first to sample the Dark Energon. While the forbidden fuel did live up to its fabled empowering properties, it also made the Terrorcons even hungrier and harder to control than ever. Quite soon, they turned on their fellow Decepticons and nearly cannibalized them. However, Megatron had always prepared himself for the event that this most savage of teams would eventually turn on him and had instructed the Predacons on how best to subdue them. Almost as soon as it began, the Terrorcons' revolt was ended when all five of them were slain. But unfortunately, they didn't stay that way. It was only then did the Decepticons learned of Dark Energon's most terrible power: reanimating the dead. Now the zombified Terrorcons, still bearing the fatal wounds inflicted on them, have become a worst threat than ever and living nightmares in the worst sense. Well, it's Halloween everyone. I haven't figured out how to upload the pictures here, but they're all available in my gallery if you want to look at them...if you dare. Personal Quote: Where there's a Yin, there's a Yang. Hello can I ask you something? 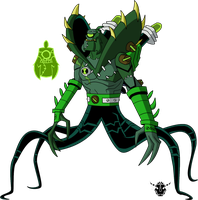 Can you commission some of my fusions for the Biomnitrix unleashed?